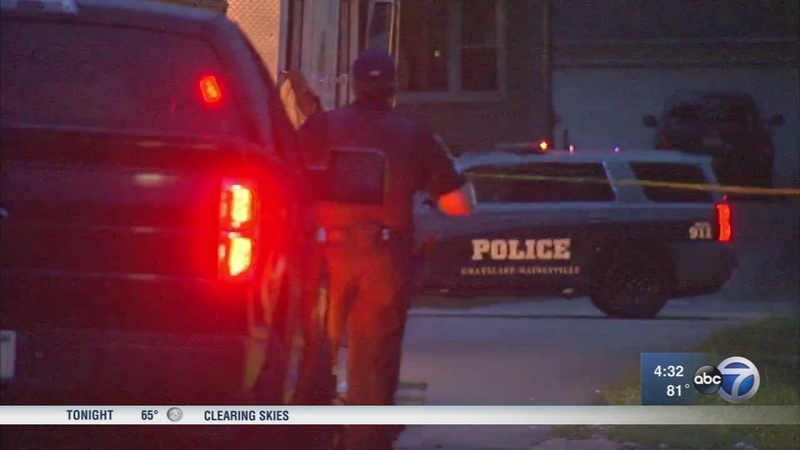 GRAYSLAKE, Ill. (WLS) -- A 17-year-old boy died Saturday after he was rescued from a Grayslake house fire Aug. 22. He had been shot in the head. The teen's identity has not yet been released.An autopsy on Sunday did not determine a cause of death. Police and firefighters responded to a home in the 300-block of Normandy Lane at approximately 12:37 a.m.
Two residents escaped the house, but the 17-year-old boy was trapped on the second floor, police said. Three officers made several attempts to enter the house before crouching down on the ground and forming a human chain to get through the thick smoke. "They couldn't see, so they were all in constant contact with each other through touch. That's how they went up the stairs," Grayslake Police Chief Phil Perlini said. "They could hear him breathing and moaning and groaning as they went up the stairs. They are feeling every step of the way. They went up and finally felt a shoulder, I believe, and they pulled him down the stairs." The teenager was taken to the burn unit at Loyola in critical condition, where he died. All three officers were treated for smoke inhalation at Condell Hospital and are expected to recover. Two dogs that were in the house died in the fire, but a third dog survived after a neighbor gave it oxygen. A .38 caliber pistol was found in the home, police said. The boy's grandmother and guardian, Deborah St. Antoine-Browne, jumped to her death from the Loyola Hospital parking garage in Maywood on Aug. 24, after she was interviewed by police. Before she died, Antoine-Browne gave her granddaughter a bottle of prescription pills with instructions to take all of them, authorities said. Police said the granddaughter took some of the medication before seeking help in the Loyola Hospital Emergency Department. Investigators said the fire started in a dryer vent. "There is some circumstances inside that weren't ordinary. We are just doing our due diligence here to find out what happened," Perlini said. He did not elaborate on those circumstances. He said since the cause of the fire was not immediately known, investigators called for extra hands to help. The Grayslake Fire Protection District is investigating the fire with assistance from the Illinois State Fire Marshal's Office and the Lake County Major Crime Task Force. The boy's gunshot wound and St. Antoine-Browne's death and actions toward her granddaughter are still under investigation.